Parents are role models and instrumental in setting a daily routine to make their children understand the importance of oral hygiene. 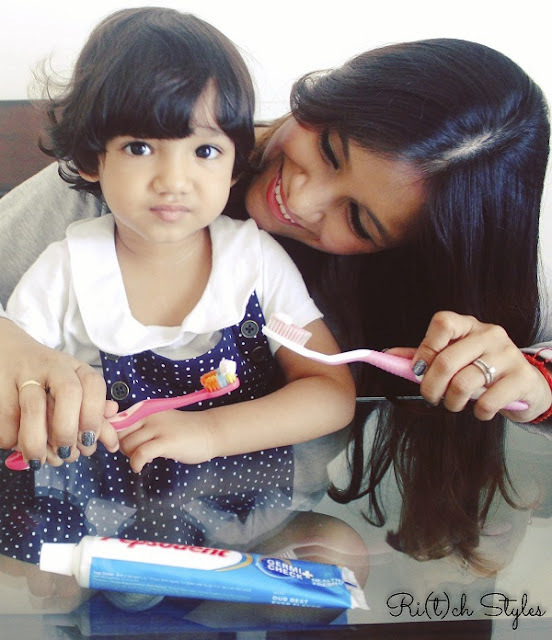 Aryaa is going to turn 2 next month and has a lot of teeth now, but I started her oral care even before she got her very first tooth. It started with gum care because just like the roots of a tree, the gums are the foundation of strong, healthy teeth, and later when her teeth started appearing it involved tooth care as well. Initially it was me who used to make her brush but now she does it on her own with guidance. Once you decide to let your child brush on his/her own, for the first few days hold their hand and guide them so that they get some understanding of movement and direction. Always put the toothpaste yourself on their brush which should be a pea size amount for a toddler. Tell them that the younger they are, the smaller the quantity of toothpaste they'll get. It makes them look forward to growing up and get more toothpaste on their bushes. Also it makes them understand that since you are older, you have more on your brush. Prateek, me or my parents make sure to brush with Aryaa when she is brushing so that she enjoys it as a bonding activity as well as imitates us and thus learns. This is a key role model technique. 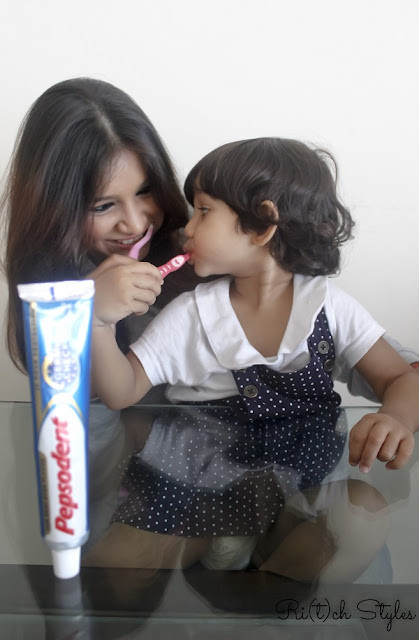 One of the best ways to get your kid to love brushing, is choosing a flavour that you think they will love. For that first taste the toothpaste yourself and in case you love the taste, there is a huge chance that your child will love it too. Brush in front of a mirror so that the child can see what he/she is doing and where exactly the brush is going. Make it fun by using a cartoon timer to time the activity for about two minutes. Use a very soft bristled brush so that even if the child is rough by chance, he/she doesn't really hurt their gums and teeth. 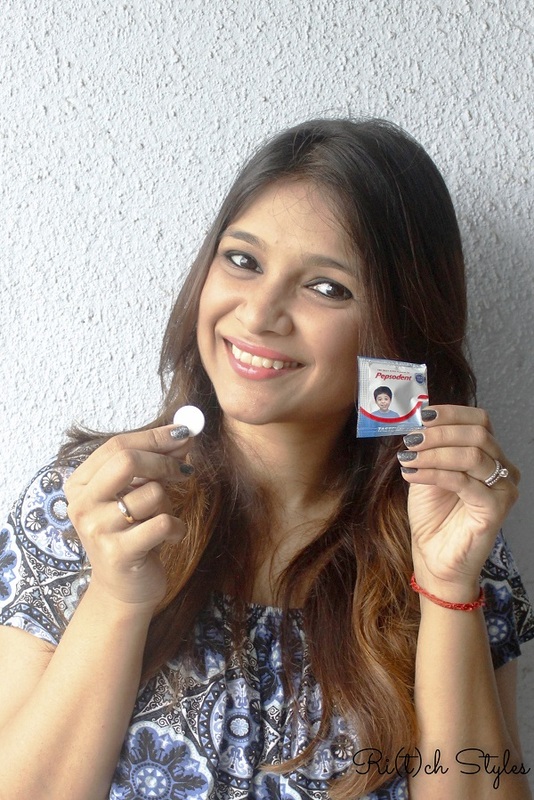 Use toothpastes that are specially available for children under the age of 2 and once they are 2 or close to 2 you can start using a toothpaste with fluoride. A trip to the dentist every six months is a must even if you don't see any issues. It is always better to do this to catch any problems early as they say prevention is better than cure. 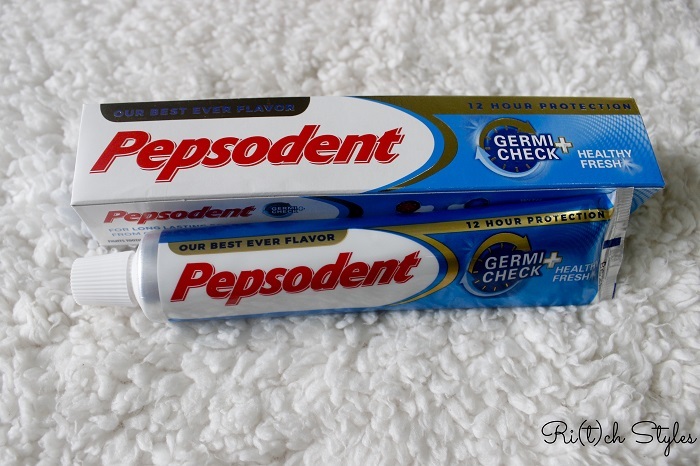 Pepsodent India has relaunched their Germicheck variant in a new flavour. They did a very interesting print innovation, where they sent out a taste tablet of their new fresh and minty flavour in a newspaper ad, which you could try before you bought the toothpaste. I loved the taste of the tablet which made me buy the toothpaste immediately.